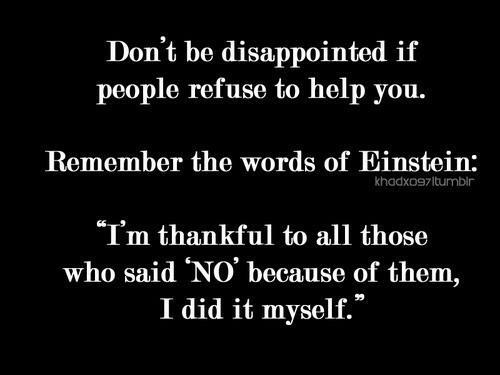 Luckily I was never refused before when I asked for help. Probably because I know the people whom I can turn to in times of trouble. I'm grateful that I have good friends that stand by me through thick and thin. I'm happy to have relatives and a family I can lean on but if that day comes when someone or somebody refuses to help then I just have to think of this quote to remind me that I can do it or I can make a way to come through the storm. It will be my motivation to prove to other people that it's not the end of the world if they didn't help me. Judging my personality, I've always have ways and plans to make things work out for me.